Here are some questions raised recently in the English and Scottish Parliaments. We also set out below why the answers so far given are false. This is also not the first time UK Parliaments have been given false information in Parliamentary answers from British Health Ministers [Details below]. 30 Years of Secret Official Transcripts Show UK Government Experts Cover Up Vaccine Hazards To Sell More Vaccines And Harm Your Kids March 14, 2012. Anne Milton: In March a judge presiding over a case in Rimini Italy made a decision to award compensation to the parents of a nine year old boy on the basis that a vaccination against measles, mumps and rubella (MMR) had caused autism. This decision reflects the opinion of a judge on the specific facts of this single case and should not be seen as a precedent for any other case. The safety of MMR has been endorsed through numerous studies in many countries, and no causal link between MMR vaccine and autism has been established. There are no plans to undertake further research nor to change MMR immunisation policy as a result of this Italian court decision. To ask the Scottish Executive what its position is on the judgement in Italy in the case of Valentino Bocca relating to MMR inoculations and autism. To ask the Scottish Executive whether it will review the use of the MMR vaccine following the recent judgement in Italy in the case of Valentino Bocca relating to MMR inoculations and autism. The Scottish Government bases vaccination policy on the independent expert advice provided by the Joint Committee on Vaccination and Immunisation. The view of the JCVI is that there is overwhelming scientific evidence that MMR does not cause autism. In March a judge presiding over a case in Rimini Italy decided to award compensation to the parents of a nine year old boy on the basis that a vaccination against measles, mumps and rubella (MMR) had caused autism. This decision reflects the opinion of a judge on the specific facts of this single case and should not be seen as a precedent for any other case. Why are the answers false? The judgement was not the opinion of the judge nor is this a single case. Ms Milton states . “This decision reflects the opinion of a judge on the specific facts of this single case …“. What made the case special is that the Italian Health Ministry did not contest that the MMR vaccine caused Valentino Bocca’s autism. It is also not the first Italian case so it is not a “single case”. You will also see from the following that Ms Milton’s suggestion that “no causal link between MMR vaccine and autism has been established.” is contradicted also by what follows. It is the first case in Italy where causation of autism by the MMR vaccine was not contested by The Italian Health Ministry. The Judge had no option but to follow the evidence of the independent expert appointed by the Court to report to it. The terms in which judgement was issued follows the terms of the conclusions of the expert. There were two other experts who came to the same conclusions regarding causation. There was also a previous contested case in Italy where a different Italian Court and a different Italian Judge on the evidence of that case also decided that the MMR vaccine caused autism in a different Italian child. That was Tribunale di Busto Arsizio, and the lawyer acting in that case is Avv. Saverio Crea. There are 100 pending cases with the Rimini lawyer – which was also reported in The Independent. As you can see from the following, there have been US cases but it is just not known how many because no records are being kept. Dr Julie Gerberding when Director US Centers for Disease Control. The above item relates to the Hannah Poling case where a child was awarded US$1.5m for an autistic condition caused by 9 vaccines in one day, including MMR. It was dismissed by the US CDC as a case of a child with a rare condition. It appears from subsequent research that the mitochondrial condition may not be rare and may be more common in children and adults than was previously thought the case. It would be helpful if the Minister might be persuaded to correct the position regarding the previous answer given in 2009 about the US case of American child Bailey Banks. Bailey Banks received compensation for an autistic condition resulting from the administration of the MMR vaccine. A British Health Minister Dawn Primarolo told Parliament Bailey Banks was not autistic when his condition is one of the recognised Autistic Spectrum Conditions. So a previous completely and utterly false answer to add to the latest false answers. The JCVI is neither independent nor expert. The members of the JCVI have historically had numerous conflicts of interest. They are also not experts in the fields appropriate for providing advice to Government on vaccination policy. As previously noted, the Italian Court did have an independent expert appointed by the Court in addition to expert assessments by two other experts. The Court appointed expert concluded that the prior published studies were “extensive conflicting material”. And now we can see that the “scientific evidence” being relied on is epidemiological studies. Epidemiological studies are observational studies which are not science. This also suggests the JCVI lack the expertise to appreciate a series of facts of fundamental significance to their “advice” to Government. Epidemiological studies can also never establish “no link”. They can only tentatively establish whether there appears to be an association between a condition and an environmental factor. They can never establish there is no association and they can never establish that in an individual case that an environmental factor like a vaccine did not cause a specific individual’s condition. The only way adverse reactions to any pharmaceutical can be assessed is by detailed clinical follow-up to investigate individual cases. That has never been done. And the so-called epidemiological studies are not true epidemiological studies. In a true study there has to be clinical follow-up and investigation of all or practically all cases. That has never been done. So the “science” government relies on is “tobacco science”. Or put this another way – Government is lying again. The Justice Department said that British drugmaker will plead guilty to promoting popular antidepressants Paxil and Wellbutrin for unapproved uses. The company also will plead guilty to failing to report to the government for seven years some safety problems with diabetes drug Avandia, which was restricted in the U.S. and banned in Europe after it was found in 2007 to sharply increase the risks of heart attacks and congestive heart failure. And don’t forget – what are we supposed to think of people like the GSK Board who hired James Murdoch of News International onto their Board of Directors to protect their reputation and then had to dump him because of all the corruption associated directly with James Murdoch at News Corporation and News International which is being examined publicly in the Leveson Inquiry. And should British first ministers like Prime Minister David Cameron and Chancellor George Osborne cosy up to a company like GSK? Should we as the public cross the street to avoid GSK and all who have anything to do with it? If 2008 is the cut-off date then is it the case that any current GSK Director on the Board prior to 2008 is one of those ultimately responsible for overseeing fraud – yes that’s right – fraud? As you can see of the 16 current GSK Board members, 10 were on the Board during and/or prior to 2008 and 11 up to October 2010. So should these people be on the Board of any company? And if not, what are they still doing there? These are fair questions to ask. After all, if they can let their companies get away with fraud then everyone might as well do the same. And what did they know of these frauds? And if they claim they knew nothing – then why are they on the Board of the Company in the first place. Sir Christopher Gent – joined the Board as Deputy Chairman in June 2004. Sir Andrew Witty – Chief Executive Officer – joined the Board in January 2008. Dr Stephanie Burns – Non-Executive Director – joined the Board in February 2007. Stacey Cartwright – Non-Executive Director joined the Board in April 2011. Larry Culp – Non-Executive Director joined the Board in July 2003. Sir Crispin Davis – Non-Executive Director joined the Board in July 2003. Simon Dingemans – Chief Financial Officer joined the Board in January 2011. Lynn Elsenhans – Chief Financial Officer joined the Board in July 2012. Judy Lewent – Non-Executive Director joined the Board in April 2011. BUT She is the former Executive Vice President and Chief Financial Officer of Merck & Co., Inc. which is a corporation which has previously been found guilty of fraud. Sir Deryck Maughan – Non-Executive Director joined the Board in June 2004. Dr Daniel Podolsky – Non-Executive Director joined the Board in July 2006. Dr Moncef Slaoui – Chairman, Research & Development joined the Board in May 2006. Tom de Swaan – Non-Executive Director joined the Board in January 2006. Jing Ulrich – Non-Executive Director joined the Board in July 2012. CHS here reports on Merck facing another second Court action in the USA for allegedly fraudulently representing its MMR II vaccine worked as claimed when it did not. Full details below. The problem for the public in the UK, USA and rest of the world is this – they have repeatedly been told by public health officials that numerous studies have shown the MMR vaccine is safe and effective. But here we see that appears not to be true. In fact it is allegedly not true to the extent of being a fraud. If these studies claim to have found the vaccine is effective when it is not how can they possibly have found it to be safe. Answer: they cannot. Additionally, if this has happened for one pharmaceutical, what other similar practices does Merck engage in with other drug products and vaccines. REFERENCES 1. Sharma RS . An Epidemiological study of measles epidemic in District Bhilwara ,Rajasthan. J Corn Dis 1998;20(4): 301-311. 3. Metha N.A, Nanavathi A, Jhala M . Sero-epidemiology of measles in Bombay. Indian J Med Res 1972;60 :661-669. 17. Deseda-Tous, James D, Cherry M. Persistence and degree of antibody liter by type of immune response. Am J Dis Child 1978:132 : 287-290. For your reading convenience we set out in what follows the text of the claims in the second US Court case [up to the heading “CLASS ACTION ALLEGATIONS “]. The claims in the new US Court case against Merck in the full .pdf can be read here: Chatom-Lawsuit-Merck. 1 Merck is the exclusive supplier of mumps vaccine (including M-M-R II and ProQuad) (collectively, “Mumps Vaccine”) in the U.S.
2 This lawsuit is brought as a proposed class action against Merck for unlawfully monopolizing the U.S. market for Mumps Vaccine by engaging in a decade-long scheme to falsify and misrepresent the true efficacy of its vaccine. 3 Specifically, Merck fraudulently represented and continues to falsely represent in its labeling and elsewhere that its Mumps Vaccine has an efficacy rate of 95 percent or higher. In reality, Merck knows and has taken affirmative steps to conceal –by using improper testing techniques and falsifying test data –that its Mumps Vaccine is, and has been since at least 1999, far less than 95 percent effective. 4 Merck manufactures its Mumps Vaccine using an attenuated virus. An attenuated virus is created when its pathogenicity has been reduced so that it will initiate an immune response without producing the specific disease. Pathogenicity is reduced by “passaging” the virus through a series of cell cultures or animal embryos. With each passage, the virus becomes better at replicating in the host, but loses its ability to replicate in human cells. Eventually, the attenuated virus will be unable to replicate well (or at all) in human cells, and can be used in a vaccine. When this vaccine is administered to a human, the virus in it will be unable to replicate enough to cause illness, but will still provoke an immune response that can protect against future infection. 5 However, Merck knew and understood that the continued passaging of the attenuated virus from which its Mumps Vaccine was created (over forty years ago) had altered the virus and degraded its efficacy. 6 For a variety of reasons, including Merck’s development and quest for approval of a new combination vaccine that contained its Mumps Vaccine, Merck initiated new efficacy testing of its Mumps Vaccine in the late 1990s. As demonstrated below, the goal of this new efficacy testing was to support its original efficacy findings at all costs, including the use of scientifically flawed methodology and falsified test results. 7 First, Merck designed a testing methodology that evaluated its vaccine against a less virulent strain of the mumps virus. After the results failed to yield Merck’s desired efficacy, Merck abandoned the methodology and concealed the study’s findings. 8 Second, Merck designed an even more scientifically flawed methodology, this time incorporating the use of animal antibodies to artificially inflate the results, but it too failed to achieve Merck’s fabricated efficacy rate. Confronted with two failed methodologies, Merck then falsified the test data to guarantee the results it desired. Having reached the desired, albeit falsified, efficacy threshold, Merck submitted these fraudulent results to the Food & Drug Administration (“FDA”) and European Medicines Agency (“EMA”). 9 Third, Merck took steps to cover up the tracks of its fraudulent testing by destroying evidence of the falsified data and then lying to an FDA investigator that questioned Merck about its ongoing testing. Merck also attempted to buy the silence and cooperation of its staff by offering them financial incentives to follow the direction of the Merck personnel overseeing the fraudulent testing process. Merck also threatened a relator in the Qui Tarn Action, Stephen Krahling, a virologist in Merck’s vaccine division from 1999 to 2001, with jail if he reported the fraud to the FDA. 10 Fourth, in 2004 Merck submitted its application for approval for ProQuad, a combination vaccine containing mumps, measles, rubella and chickenpox vaccines, certifying the contents of the application as true even though Merck knew the statements about the effectiveness of the Mumps Vaccine were, in fact, false. At no time during this application process did Merck disclose to the FDA the problems of which it was aware (or should have been aware) relating to the significantly diminished efficacy of its Mumps Vaccine. Accordingly, in 2005, the FDA approved Merck’s application for ProQuad. 11 Fifth, Merck sought and secured FDA approval to change the labeling for M-M- R II -which is composed of Merck’s mumps, measles and rubella vaccines -to reflect an almost 40 percent reduction in the minimum potency of the Mumps Vaccine component. It did this while leaving its false representations of efficacy unchanged. And it did this fully appreciating that if the current, higher potency vaccine had an efficacy rate far lower than the falsely represented 95 percent, there was no way the vaccine would achieve that efficacy with significantly less attenuated virus in each shot. 12 Sixth, Merck continued to conceal what it knew (or should have known) about the diminished efficacy of its Mumps Vaccine even after significant mumps outbreaks in 2006 and 2009. 13 To be sure, Merck has now known for over a decade that its Mumps Vaccine is far less effective than advertised publicly and represented to government agencies. As Merck profited from its unlawful scheme, health care providers around the country have purchased millions of doses of Mumps Vaccine, with questionable efficacy, at artificially inflated prices. 14 Plaintiff Chatom Primary, Care P.C. is an Alabama corporation. During the Class Period (defined below), Chatom Primary Care, P.C. purchased the Mumps Vaccine from Merck at artificially inflated prices. 15 Defendant Merck is a New Jersey corporation with its vaccine division based in West Point, Pennsylvania. Merck-directly and/or through its subsidiaries, which it wholly owned and/or controlled-manufactured, marketed and/or sold Mumps Vaccine that was purchased throughout the United States, including in this district, during the Class Period. Merck is one of the largest pharmaceutical companies in the world with annual revenues exceeding $20 billion. Merck is also a leading seller of childhood vaccines and currently markets in the U.S. vaccines for 12 of the 17 diseases for which the CDC currently recommends vaccination. 16 Merck is the sole manufacturer licensed by the FDA to sell Mumps Vaccine in the U.S. Merck’s Mumps Vaccine, together with Merck’s vaccines against measles and rubella are sold as M-M-R II. Merck annually sells more than 7.6 million doses of M-M-R II in the U.S. for which it derives hundreds of millions of dollars of revenue. Merck also has a license in the U.S. to sell ProQuad, a combination vaccine containing M-M-R II vaccine and chickenpox vaccine. Under a license from the EMA, Merck also sells Mumps Vaccine in Europe as a part of M-M-RVaxpro and ProQuad through Sanofi Pasteur MSD, a joint venture with the vaccine division of the Sanofi Aventis Group. ProQuad has been sold intermittently in the U.S. and Europe since its approval in 2005 until 2010. 17 The claims set forth in this Complaint arise under Section 2 of the Sherman Antitrust Act, 15 U.S.C. 9 2. Plaintiff seeks treble damages pursuant to Section 4 of the Clayton Act, 15 U.S.C. 5 15(a). Plaintiff also asserts claims for actual and exemplary damages pursuant to state consumer protection and warranty laws, and common law unjust enrichment, and seeks to obtain restitution, recover damages and secure other relief against Defendant for violations of those laws. Plaintiff and the Class (defined below) also seek attorneys’ fees, costs, and other expenses permitted under federal and state law. 18 This Court has jurisdiction pursuant to Sections 4 and 12 of the Clayton Act, 15 U.S.C. 99 15(a) and 22, and pursuant to 28 U.S.C. $5 1331 and 1337. 19 This Court also has subject matter jurisdiction of the state law claims pursuant to 28 U.S.C. 9 1332(d), in that this is a class action in which the matter or controversy exceeds the sum of $5,000,000, exclusive of interests and costs, and in which some members of the Class are citizens of a state different from Defendant. 20 This Court also has supplemental jurisdiction of the state law claims asserted herein pursuant to 28 U.S.C. fj 1367 because they are so related to the claims asserted in this action over which the court has original jurisdiction that they form part of the same case or controversy. 21 Venue is proper in this District pursuant to Sections 4 and 12 of the Clayton Act (15 U.S.C. $9 15(a) and22) and 28 U.S.C. 5 1391(b) and (c) in that the Defendant can be found in and transacts business within this District, and a substantial part of the events or occurrences giving rise to the claims alleged occurred in this District. Indeed, Merck’s fraudulent scheme to maintain and further its monopoly power was originated and continues to be carried out in this District at Merck’s vaccine division facility in West Point, Pennsylvania. 22 Throughout the Class Period, Merck manufactured, produced, sold and/or shipped substantial quantities of Mumps Vaccine in a continuous and uninterrupted flow of transactions in interstate commerce throughout the U.S., including within this District. Merck’s unlawful activities that are the subject of this Complaint were within the flow of, and have had a direct and substantial effect on, interstate trade and commerce. 23 Mumps is a contagious viral disease characterized by fever, headache, muscle weakness, loss of appetite and swelling of one or more of the salivary glands. Although severe complications are rare, the mumps virus can cause inflammation of the brain and spinal cord (among other organs), sterility and deafness. 24 Merck first obtained approval for the Mumps Vaccine in 1967 from Department of Biologics Standards of the National Institute of Health (“DBS”), the government agency at the time responsible for licensing vaccines. The vaccine was developed by Dr. Maurice Hilleman, at Merck’s West Point research facility, from the mumps virus that infected his five year-old daughter Jeryl Lynn. Merck continues to use this “Jeryl Lynn” strain of the virus for its vaccine today. 25 Merck’s original Mumps Vaccine was delivered to patients in a single, stand-alone injection called Mumpsvax. In 1971, Merck developed M-M-R and that same year obtained DBS approval to manufacture and sell M-M-R vaccine. In 1978, Merck obtained approval from the FDA (which succeeded the DBS as the agency responsible for licensing vaccines) for the manufacture and sale of M-M-R II, a replacement for M-M-R containing a different strain of the rubella virus. Since that time, Merck has sold more than 450 million doses of M-M-R II world-wide, with approximately 200 million doses sold in the U.S.
26 In September 2005, Merck obtained FDA approval for ProQuad, a multi-disease vaccine that includes vaccinations for mumps, measles, rubella and chicken pox in a single injection. Merck sold ProQuad in the U.S. from its approval in 2005 until June, 2007. According to Merck, the vaccine became unavailable because of certain manufacturing constraints. The vaccine was briefly available again in 2010 but has not been available since then. 27 As the only company licensed by the U.S. government to sell Mumps Vaccine, Merck has had a monopoly and continues to have a monopoly in the U.S. market for Mumps Vaccine since it obtained its original license in 1967. This has extended to multi-disease vaccines such as M-M-R, M-M-R II and ProQuad. However, Merck has maintained this monopoly not through its legitimate business acumen and innovation or its manufacture and sale of the safest, most effective and most cost-effective Mumps Vaccine in the market. Instead, Merck has willfully and illegally maintained its monopoly through its ongoing manipulation of the efficacy of its Mumps Vaccine. Through this unlawful conduct, Merck has been able to monopolize the Relevant Market (defined below) by representing to the public and government agencies a falsely inflated efficacy rate for its Mumps Vaccine, which has deterred and excluded competing manufacturers from entering the Market. (a) The Relevant Geographic Market is The U.S.
28 The U.S. (including all U.S. territories and commonwealths) is the relevant geographic market in this case. Merck manufactures and distributes its Mumps Vaccine throughout the U.S. The unlawful and anticompetitive conduct at issue in this case affects only U.S. sales of the relevant products. Mumps Vaccine requires FDA licensing before it can be sold in the U.S.
29 The U.S. sale of Mumps Vaccine (including without limitation M-M-R II and ProQuad) (the “Relevant Market”) is the relevant product market in this case. 30 There are significant barriers to entry inherent in the manufacture and sale of a new vaccine. Vaccine production is a capital-intensive, fixed-costs-based business, with the average cost to bring a vaccine to market of about $700 million. Moreover, the research, development, testing and government approval process is very expensive, time-consuming and risky. Several years and millions of dollars might be spent on developing a new vaccine only to find it fail in the final stages of testing, or to have the government refuse to approve it or significantly limit its application or distribution. Vaccine manufacturers will therefore invest in developing a new vaccine only where they see both a need for the vaccine as an improvement over an existing vaccine and an opportunity to make a large enough return on the significant capital investment and risk involved. 31 In the case of the U.S. Market for Mumps Vaccine, this substantial and inherent barrier to entry is compounded by the falsely inflated efficacy rate of Merck’s vaccine. As with the market for any product, a potential competitor’s decision to enter a market hinges on whether its product can compete with those products already being sold in the market. If an existing vaccine is represented as safe and at least 95 percent effective, as Merck has falsely represented its vaccine to be, it would be economically irrational for a potential competitor to bring a new Mumps Vaccine to the Relevant Market unless it thought it could compete with the safety and efficacy of the existing vaccine. Health care providers, including Plaintiff and the Class, would not purchase it otherwise. 32 For those seeking immunization for mumps, Mumps Vaccine is the only product available to achieve that result. 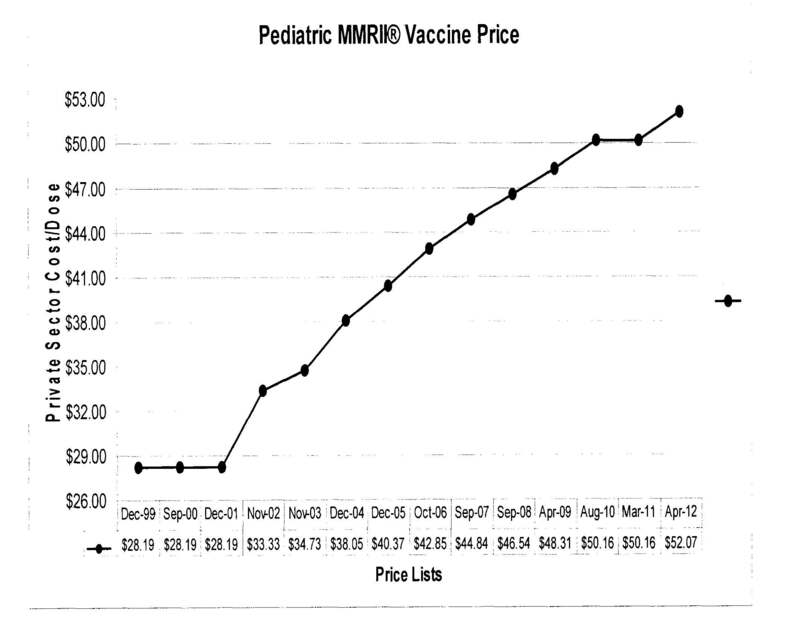 So regardless of the price Merck charges for its Mumps Vaccine, the extent or frequency of any price increases for the vaccine, or whether Merck incorporates the vaccine into multi-disease vaccines, as it does with M-M-R II and ProQuad, there are no alternative products to which the government, health care professionals or consumers can turn to obtain this immunization. 33 The U.S. Market for Mumps Vaccine is further defined by the CDC’s nationwide schedule of recommended childhood vaccinations, including a vaccination against mumps, and the requirement around the country that all public school students be vaccinated against mumps (among other childhood diseases). If a child is to attend public school –not to mention any private school, university, summer camp or other educational or recreational institution in this country –he or she must be vaccinated for mumps. There is no choice (but for rare exceptions). There is no alternative. No other products can substitute for this required vaccination. 34 To obtain its original government approval to sell its Mumps Vaccine, Merck conducted field studies of vaccinated children and concluded that the vaccine had an efficacy rate of 95 percent or higher. This meant that 95 percent of those given the vaccine were considered immunized against mumps. This is important because when an adequate number of people have immunity, the chances of an outbreak are reduced, and –ultimately –eliminated. If there is insufficient immunity, a real risk of continued disease outbreaks exists. When a mumps outbreak occurs in vaccinated populations, it afflicts adults and older children who are at greater risk of serious complications. 35 While Merck obtained its original license in 1967 stating that its vaccine was at least 95 percent effective, Merck had known and knows that the vaccine’s efficacy is significantly less than that now. Merck knows that the continued passaging of the attenuated virus to make more vaccine for distribution has altered the virus and has degraded the efficacy of the product. 36 Rather than develop a new Mumps Vaccine with greater efficacy, or permit other manufacturers to enter the U.S. Market with a competing vaccine, Merck has instead taken pains to unlawfully and unethically preserve its exclusive U.S. license by maintaining that its more than forty-year old vaccine continues to have an efficacy rate of 95 percent or higher. This was easy to do for awhile because Merck was able to refer back to the efficacy testing it conducted in connection with the government’s original granting of Merck’s license to sell Mumps Vaccine. However, beginning in the late 1990s, Merck initiated new efficacy testing of its Mumps Vaccine. This testing coincided with an application to change the M-M-R II labeling in the U.S. and an application for a license to sell M-M-R II in Europe. This testing also coincided with Merck’s development and quest for approval of ProQuad in both the U.S. and Europe. 37 Without demonstrating that its Mumps Vaccine continued to be 95 percent effective, Merck risked losing the monopoly it had over the sale of Mumps Vaccine in the U.S. With respect to M-M-R II or Mumpsvax, Plaintiff and members of the Class would either have negotiated to pay less for the vaccine or stopped purchasing Merck’s vaccine altogether as the door would be open to new manufacturers to enter the Market. With respect to ProQuad, the government might not have approved the vaccine at all for sale and use in the U.S. Under any of these scenarios, Merck risked losing hundreds of millions of dollars in revenue from this very profitable unlawful monopoly. 38 So, Merck set out to conduct testing of its Mumps Vaccine that would support its original efficacy finding. In performing this testing, Merck’s objective was to report efficacy of 95 percent or higher regardless of the vaccine’s true efficacy. The only way Merck could accomplish this was through manipulating its testing procedures and falsifying the test results. Relators to the Qui Tarn Action participated on the Merck team that conducted this testing and witnessed firsthand the fraud in which Merck engaged to reach its desired results. Merck internally referred to the testing as Protocol 007. 39 The original methodology Merck employed under Protocol 007 was a Mumps Plaque Reduction Neutralization (“PRN”) Assay. Preliminary testing commenced in 1999 at Merck’s West Point facility and was led by Senior Investigator David Krah and his second in command, Mary Yagodich. Merck’s Executive Director of Vaccine Research, Alan Shaw, approved the testing methodology Krah and Yagodich employed. Relator Krahling witnessed Krah and Yagodich as they conducted the preliminary testing. 40 As the name of the test indicates, the PRN test measures the virus neutralization that occurs after administration of the Mumps Vaccine. Merck’s test was in some measure similar to the testing procedure regarded in the scientific community as the “gold standard” for testing how well a vaccine works. Blood samples are taken from children both before they receive the vaccine and again after they have been injected with the vaccine (after sufficient time has passed for the vaccine to produce an immune response). The paired blood samples are then individually incubated with the target virus and added to sheets of cells. Where the virus replicates in the cell sheet it leaves a plaque, or hole. 41 The pre-vaccinated child will not typically have immunity to the disease. Therefore, the pre-vaccinated blood will be unable to neutralize the virus and plaques will form where the virus has infected the cells. In contrast, if the vaccine has stimulated the child’s immune system to develop antibodies against the virus, the post-vaccinated blood will neutralize the virus. The post-vaccinated blood sample will consequently show a smaller number of plaques, or holes, in the cell sheet compared to the pre-vaccinated sample. 42 A PRN test simply compares virus growth in the presence of the pre- and post- vaccinated blood samples. The number of plaques (where the virus has grown) is compared to determine if the vaccine caused the child to develop a sufficient level of antibodies to neutralize the virus. Results are reported in terms of seroconversion. A seroconversion occurs when the pre-vaccination blood sample is “negative” (meaning, insufficient antibodies to neutralize the virus) and the post-vaccination sample is “positive” (meaning, sufficient antibodies to neutralize the virus). Seroconversion occurs, therefore, when a blood sample goes from “pre-negative” (insufficient antibodies) to “post-positive” (sufficient antibodies). Seroconversion in the lab is the best correlate for efficacy –how successful the vaccine is at immunizing children. For the purposes of its testing, Merck was looking for a seroconversion rate of 95 percent or higher to support its original efficacy finding and the efficacy it continued to represent in its labeling. 43 While Merck’s PRN test was modeled after the neutralizing test generally accepted in the industry, it diverged from this “gold standard” test in a significant way. It did not test the vaccine for its ability to protect against a wild-type mumps virus. A wild-type virus is a disease-causing virus. That is the type of real-life virus against which vaccines are generally tested. Instead, Merck tested the children’s blood for its capacity to neutralize the attenuated Jeryl Lynn strain of the virus. This was the same mumps strain with which the children were vaccinated. The use of the attenuated Jeryl Lynn strain, as opposed to a virulent wild-type strain, subverted the fundamental purpose of the PRN test, which was to measure the vaccine’s ability to provide protection against a disease-causing mumps virus that a child would actually face in real life. The end result of this deviation from the accepted PRN gold standard test was that Merck’s test overstated the vaccine’s effectiveness. 44 Even with a deviation that could only overstate how well the vaccine worked, the results from Merck’s preliminary testing (which involved testing blood samples of approximately 60-100 children) yielded seroconversion rates significantly below the desired 95 percent threshold. Krah admitted as much to Relator Krahling. He also admitted to Krahling that the efficacy of Merck’s vaccine had declined over time, explaining that the constant passaging of virus to make more vaccine for distribution had degraded the product and that because of this, mumps outbreaks would increase over time. 45 Krah further admitted to Krahling that he and Yagodich tried numerous other, often undocumented, techniques to modify the PRN test to improve the seroconversion results they could measure, including trying different virus dilutions, different staining procedures and even counting plaques more liberally. These other techniques –like using the vaccine strain rather than a wild-type strain of the virus –subverted the purpose of the PRN test. In the end, however, none of it mattered. Merck had to abandon its methodology because no matter how Krah and Yagodich manipulated the procedures, they could not reach the 95 percent seroconversion threshold. 46 So, Merck abandoned the PRN methodology that yielded unsatisfactory results and worked towards developing a new, rigged methodology that would allow Merck to report its desired seroconversion results. 47 The new methodology Merck devised and ultimately used to perform the mumps efficacy testing under Protocol 007 was an “enhanced” PRN Assay. It was again led by Krah and approved by Shaw and commenced in 2000. Relators Krahling and Wlochowski participated on the team that conducted the testing using this supposedly enhanced methodology. Each of them witnessed firsthand the falsification of the test data in which Merck engaged to reach its 95 percent seroconversion threshold. In fact, each was significantly pressured by Krah and other senior Merck personnel to participate in this fraud. Objective: Identify a mumps neutralization assay format . . . that permits measurement of a > 95% seroconversion rate in M-M- R II vaccinees. 49 To reach the stated objective for its “enhanced” test and increase the measured seroconversion rate to the predetermined 95 percent threshold, Merck continued to use its scientifically flawed PRN methodology –that tested against the vaccine strain rather than a wild-type strain –but with one additional material change. Merck added animal antibodies to both the pre and post-vaccination blood samples. The use of animal antibodies in laboratory testing is not uncommon. They can serve as a highlighter of sorts to identify and count human antibodies that otherwise might not be identifiable on their own. When used in that way, animal antibodies make it easier to see the human antibodies. They do not alter what is being measured. However, Merck added animal antibodies for the singular purpose of altering the outcome of the test by boosting the amount of virus neutralization counted in the lab. 50 In a laboratory setting, animal antibodies can combine with human antibodies to cause virus neutralization that would not otherwise occur from the human antibodies alone. Merck’s “enhanced” methodology permitted various types of human antibodies to be counted as mumps neutralizing antibodies when it was actually the animal antibodies combining with those human antibodies causing the neutralization. Merck also did not apply a proper “control” to isolate whether virus neutralization was caused by the human antibodies alone or in combination with the animal antibodies. Rather, Merck included in its seroconversion measure all virus neutralizations regardless of whether they resulted from human antibodies or by their combination with the animal antibodies. This “enhanced” PRN methodology thereby allowed Merck to increase dramatically the recordable instances of mumps virus neutralization and to count those neutralizations toward seroconversion and its measure of the vaccine’s success. 51 Merck knew that the neutralizations attributable to the animal antibodies would never exist in the real world. This is because the human immune system, even with the immunity boost provided by an effective vaccine, could never produce animal antibodies. And adding this external factor as a supplement to a vaccine was not an option because it could result in serious complications to a human, even death. Thus, the “uncontrolled” boost to neutralization Merck designed using these animal antibodies in its laboratory did not in any way correspond to, correlate with, or represent real-life (invivo)virus neutralization in vaccinated people. 52 But the use of the animal antibodies allowed Merck to achieve its high seroconversion objectives. In fact, paired blood samples that were found under Merck’s 1999 PRN methodology to lack sufficient virus neutralizing antibodies were now considered seroconverted using the “enhanced” methodology. Indeed, in one panel of sixty paired blood samples, Merck measured a seroconversion rate of 100 percent. In other words, non-neutralizing concentrations of antibodies that would never protect a child from mumps in the real world were, under Merck’s “enhanced” methodology, treated as vaccine successful solely because of the additional neutralization provided by the animal antibodies. 53 Krah defended the use of the animal antibodies in the “enhanced” PRN test by pointing to the FDA’s purported approval of the process. However, whatever FDA approval Merck may have received for this testing, there is no indication that the FDA was fully aware of the extent of Merck’s manipulation of the testing, including Merck’s wholesale fabrication of test data to reach its preordained 95 percent efficacy threshold. 54 There was a significant problem with Merck’s improper use of the animal antibodies to boost its virus neutralization counts which would be evident to any scientist reviewing the test data. The animal antibodies boosted neutralization counts not only in the post- vaccination blood samples. They also boosted neutralization counts in the pre-vaccination samples. However, too much virus neutralization in the pre-vaccinated sample created a “pre- positive,” which means enough virus neutralization to characterize the child as immune without the vaccine. 55 Pre-positives ordinarily occur in a small percentage of the child population that is immune to mumps even without vaccination. This immunity would principally come from a previous exposure to the mumps virus, or from immunity transferred to a child from the mother in utero. However, the incidence of this immunity is small, generally measured by the scientific community at around 10 percent of the child population. 56 The problem for Merck was that with the addition of the animal antibodies to the pre-vaccination blood samples it was seeing a significantly higher percentage of pre-positives than the 10 percent industry recognized occurrence of such immunity. In the results of one test that Relators Krahling and Wlochowski both witnessed in the summer of 2001, the pre-positive rate was more than 80 percent. Krah instructed Wlochowski to throw out the results and the actual experimental plates of that particular test, thereby destroying all traces of the unwanted results. 57 The existence of such a high percentage of pre-positives threatened the viability of Merck’s “enhanced” methodology. As a practical matter, with a pre-positive, any favorable results in the post-vaccinated sample could not be counted as a vaccine success toward the 95 percent efficacy target. A sample appearing positive before the vaccine, and staying positive after the vaccine, was not a seroconversion. 58 Just as important, the high pre-positive rate would red flag the methodology as flawed. The FDA would question the results of a test that had such a high level of pre-positives. Krah stated this explicitly to the members of his lab, including Relators Krahling and Wlochowski. If Merck wanted to keep the artificial boost in post-vaccination positives provided by the animal antibodies, it would have to eliminate the associated boost in pre-vaccination positives. 60 The problem was that no amount of tinkering with the amount of animal antibodies added would produce a pre and post-vaccination virus neutralization for Merck’s vaccine within the desired range. Without the animal antibodies, Merck could not support a sufficient level of post-vaccination neutralization. Conversely, by adding the animal antibodies, Merck could not avoid having too high a level of pre-vaccination neutralization (i.e. too many pre-positives). This left only one way for Merck to reach its desired seroconversion outcome –falsify the test results. 61 Specifically, Krah and Yagodich and other members of Krah’s staff falsified the test results to ensure a pre-positive neutralization rate of below 10 percent. They did this by fabricating their plaque counts on the pre-vaccination blood samples, counting plaques that were not actually there. With these inflated plaque counts, Merck was able to count as pre-negative those blood samples that otherwise would have been counted as pre-positive because of the increased neutralization caused by the animal antibodies. Krah stressed to his staff that that the high number of pre-positives they were finding was a problem that needed to be fixed. Krah directed his staff to re-check any sample found to be pre-positive to see if more plaques could be found to convert the sample to a pre-negative. Krah and Yagodich falsified plaque counts to convert pre-positives to pre-negatives, and directed other staff scientists to do the same. Krah appointed Yagodich and two others to “audit” the testing that other staff scientists had performed. These audits were limited to finding additional plaques on pre-positive samples thereby rendering them pre-negatives. Krah employed an excel spreadsheet which would automatically highlight the undesirable pre-positives so that they could be targeted more efficiently. The data was entered, highlighted and changed before it was ever saved. Krah also engaged in the destruction of evidence to minimize the chances of detection. He not only employed the excel spreadsheet which left no paper trail. He also destroyed test results, substituted original counting sheets with “clean” sheets, and ordered the staff in the lab to do the same. Merck cancelled (in March 2001) a planned outsource of the testing to a lab in Ohio because the outside lab was unable to replicate the seroconversion results Krah was obtaining in his lab. Krah and his staff conducted all the remaining testing instead. 63 Unsurprisingly, none of the “recounting” and “retesting” that Krah and his staff performed as part of the “enhanced” testing was performed on any post-vaccination samples or on any pre-vaccination samples that were pre-negative. This additional “rigor” was only applied to the pre-positive samples, the very samples Merck had identified as undesirable and which kept Merck from attaining its target of 5 10% pre-positive rate and L 95% seroconversion. 64 Relators Krahling and Wlochowski engaged in numerous efforts to stop the fraud. They questioned and complained to Krah about the methodology being employed, particularly the manipulation of pre-positive data. They attempted to dissuade others from participating. They initiated numerous calls to the FDA to expose the fraud. And they attempted to document the fraud, even as evidence of it was being destroyed. But Relators’ efforts were to no avail. For every effort they took to stop the fraud, Merck adapted the scheme to assure the falsification continued. For example, when Relators objected to changing their own plaque counts, Krah appointed other staff, as so-called auditors, willing to falsify the data. 65 In July 2001, Relators Krahling and Wlochowski secretly conducted their own audit of the test results to confirm statistically the fraud that was occurring with the “enhanced” testing. They reviewed approximately 20 percent of the data that Merck had collected as part of the “enhanced” test. In this sampling, they found that 45 percent of the pre-positive data had been altered to make it pre-negative. No pre-negatives were changed to pre-positives. No post- positives were changed to post-negatives. No post-negatives were changed to post-positives. The statistical probability of so many changes occurring in just the pre-positive data and in no other data was more than a trillion to one. And that is a conservative measure given the likelihood that an even greater number of pre-positives were changed but remained undetected because the changes were not recorded in Merck’s files. 66 Krah did not act alone in orchestrating the falsification of the “enhanced” PRN test results. He acted with the knowledge, authority and approval of Merck’s senior management. 67 For example, in April 2001, after Merck cancelled the planned outsourcing of the remainder of the Mumps Vaccine efficacy testing, Emilio Emini, the Vice President of Merck’s Vaccine Research Division, held a meeting with Krah and his staff, including Relators Krahling and Wlochowski. Emini was clearly on notice of protests that had been going on in the lab because he directed Krah’s staff to follow Krah’s orders to ensure the “enhanced” testing would be successful. He also told the staff that they had earned very large bonuses for the work they had completed on the project so far. He was going to double the bonuses and pay them once the testing was complete. 68 In July 2001, after completing the secret audit, Relator Wlochowski openly accused Krah during a lab meeting of committing fraud in the Mumps Vaccine testing. Relator Krahling then met with Alan Shaw and confronted him about the fraudulent testing. Krahling told Shaw of the falsification of the pre-positive data. Krahling also confronted Shaw about the improper use of the animal antibodies to inflate the post-vaccine neutralization counts. Shaw responded that the FDA permitted the use of the animal antibodies and that should be good enough for Krahling. Shaw refused to discuss anything further about the matter. Instead, Shaw talked about the significant bonuses that Emini had promised to pay the staff in Krah’s lab once the testing was complete. 69 Relator Krahling then met with Bob Suter, Krahling’s human resources representative at Merck. Krahling told Suter about the falsification of data and Shaw’s refusal to get involved. Krahling told Suter that he was going to report the activity to the FDA. Suter told him he would go to jail if he contacted the FDA and offered to set up a private meeting with Emini where Krahling could discuss his concerns. 71 To assuage Krahling’s concerns, Emini promised to conduct an “internal audit” of the Mumps Vaccine testing. Krahling countered that the FDA should be contacted since only the FDA could perform an audit that was truly independent. Emini ordered Krahling not to call the FDA. Immediately after the meeting, Suter approached Krahling and again threatened that he would be put in jail if he contacted the FDA. 72 The next morning, Krah arrived early to the lab and packed up and destroyed evidence of the ongoing Mumps Vaccine testing. This evidence included garbage bags full of the completed experimental plates, containing the cell sheets with plaques, that would have (and should have) been maintained for review until the testing was complete and final. The destruction of the plates would make it difficult to compare the actual plaque counts in the test with what was documented and changed on the counting sheets, as Krahling had done the day before in Emini’s office. Despite the threats he received from Suter and Emini, Krahling called the FDA again and reported this latest activity in Merck’s ongoing fraud. 73 On August 6, 2001, in response to Relator Krahling7s repeated calls, an FDA agent came to Merck to question Krah and Shaw. The FDA agent’s questions were largely focused on Merck7s process for counting plaques in the “enhanced” PRN test. Krah and Shaw misrepresented the process that Merck was actually conducting and the fact that Merck was falsifying the pre-positive test data. 74 For example, the FDA agent asked whether there was any ad hoe revisiting of plaque counts. Krah falsely responded that plaque counts were being rechecked only for verification, controls and to check hypervariability. Krah also misrepresented to the FDA that they did not change the data after it was entered in the excel workbook. When the FDA agent pressed Krah on the criteria for changing original counts on the counting sheets, Krah left the interview without answering the question. In Krah’s absence, Shaw informed the FDA agent that a memo would be added to the standard operating procedure to address changes. The FDA agent then asked Shaw why they had not taken care of this before the project started. Shaw offered that Krah and another Merck employee had identified “trends” and “problems” with the original counts without ever explaining what those “trends” or “problems” actually were. 75 The interview proceeded in this manner with Shaw and Krah obfuscating what was happening in the lab and obstructing the FDA’s efforts to find out what was really going on with Merck’s manipulation of the testing procedure to reach its targeted seroconversion rate. 76 The entire FDA interview with Krah and Shaw was short, probably less than half an hour. The FDA agent did not question Relators Krahling or Wlochowski or other members of Krah’s staff in order to corroborate what Krah and Shaw said. As far as Relators witnessed, the FDA agent did not attempt to substantiate Krah’s or Shaw’s responses by reviewing any of the testing samples or backup data that had escaped destruction. And the FDA agent did not address the actual destruction of evidence that Krah had already facilitated. 77 The FDA issued a one page deficiency report identifying a few relatively minor shortcomings in Merck’s testing process. These principally related to flaws in Merck’s record- keeping and in its validation/explanation of changes to the test data. 78 The report did not address or censure Merck for any issues relating to Merck’s improper use of the animal antibodies or Merck’s wide-scale falsification of pre-positive test data. The FDA did not discover this fraudulent activity in the course of the perfunctory visit because of Krah’s and Shaw’s misrepresentations to the FDA. 79 In order to comply with the FDA’s deficiency report, Merck made minor adjustments to its testing procedure relating to its heretofore ad hoc procedure for counting plaques. The new, more formalized procedure explicitly provided for supervisory oversight and review of plaque counts in pre-vaccinated blood samples and where plaques were difficult to read because of the condition of the sample. In other words, under the “new” procedure, Merck continued to falsify the test data to minimize the level of pre-positives and inflate the seroconversion rate. 80 After the FDA visit, Relator Krahling was barred from any further participation in the Protocol 007 Mumps Vaccine testing project. He was also prohibited from accessing any data related to the project. Shortly thereafter, he was given a poor performance review and barred from continuing to work in Krah’s lab on any matter. He was offered a position in a different lab within Merck’s vaccine division, but it involved work for which Krahling had no prior experience or interest. In December, 2001 Krahling resigned from the Company. 81 Relator Wlochowski continued to work at Merck, though she was transferred out of Krah’s lab at the end of September, 2001. She spent an additional year working at Merck in a different lab before she too left Merck. 82 Before Relators Krahling and Wlochowski left Krah’s lab, Merck conducted the internal audit Emini had promised Relator Krahling would take place. However, as Krahling had warned against, the audit was anything but independent. Unsurprisingly, therefore, Merck completed its Protocol 007 testing in late summer or early fall 2001 and Merck reported the 95 percent seroconversion it had targeted from the outset. What no one knew outside of Merck –not the FDA, the CDC or any other governmental agency –was that this result was the product of Merck’s improper use of animal antibodies and the wide-scale falsification of test data to conceal the significantly diminished efficacy of its Mumps Vaccine. 83 Notably, while Relators Krahling and Wlochowski were immediately removed from Krah’s lab for their protests against and efforts to stop the fraudulent testing, those that facilitated the fraud remained. Indeed, Krah, Yagodich and other members of Krah’s staff who were instrumental in the fraud continue to work jn vaccine development at Merck today and are still working together in Krah’s lab. 84 Since at least the beginning of the Protocol 007 testing and continuing through the present, Merck has falsely represented to the government and the public that its Mumps Vaccine has at least a 95 percent efficacy rate. It has done so even though Merck is well aware, and has taken active steps to keep secret, that the efficacy rate is far lower. 85 Merck principally has made these false representations in the package insert or labeling that accompanies each dose of Merck’s Mumps Vaccine. This is the product material that the law requires which, among other things, informs health care providers and the public of the composition of the vaccine and its overall efficacy at immunizing the recipient from contracting mumps. 86 Merck’s Mumps Vaccine insert has changed over the years, but at least one thing has remained constant –Merck’s reporting of at least a 95 percent efficacy rate. The current package insert for M-M-R II provides that “a single injection of the vaccine induced . . . mumps neutralizing antibodies in 96% . . .of susceptible persons.” Merck neither identifies the study performed or the date it was performed that supposedly supports this representation. The current insert further provides that: “Efficacy of measles, mumps and rubella vaccines was established in a series of double-blind controlled field trials which demonstrated a high degree of protective efficacy afforded by the individual vaccine components.” As support for this representation, Merck cites the more than forty-year old studies it conducted to obtain the original governmental approval for its Mumps Vaccine in 1967. Merck’s M-M-R II package insert has contained this language and “support” since at least 1999. 87 Merck’s product insert is a clear misrepresentation of the efficacy rate of its Mumps Vaccine. It cites outdated or unidentified studies that are not reflective of what Merck knows now about the vaccine’s current effectiveness as confirmed by Merck’s efforts to manipulate the methodology and ultimately falsify the data to report at least 95 percent seroconversion. In short, as Merck well knows, the efficacy rate of its Mumps Vaccine is not anywhere near 95 percent. Yet Merck continues to falsely represent a 95 percent efficacy rate to ensure its continued lock on the sale of the vaccine in the U.S.
88 Merck’s misrepresentations relating to its Mumps Vaccine have not been made just for M-M-R II. Merck has also obtained approval to sell M-M-R II in Europe and to sell ProQuad in the U.S. and Europe. Merck obtained these approvals by again misrepresenting to the FDA (in the U.S.) and the EMA (in Europe) the efficacy rate of its Mumps Vaccine. 90 In 2006, Merck obtained a license from the EMA to sell the M-M-R II analogue (called M-M-RVaxpro) through the joint venture Sanofi Pasteur MSD. Merck used the falsified results of the “enhanced” PRN test to obtain this approval. The EMA actually cited Protocol 007 as a “pivotal clinical study” in support of its decision to grant the approval. Since then, Merck has been manufacturing M-M-RVaxpro at its West Point facility for Sanofi Pasteur MSD to sell in Europe. 91 Around the same time, Merck also obtained a license from the EMA for Sanofi Pasteur MSD to sell Merck’s ProQuad in Europe. As with M-M-RVaxpro, Merck’s joint venture submitted the falsified results of Protocol 007 to the EMA as supportive clinical information in its vaccine application. Relying on this information, the EMA found “no major concern” about the efficacy of the mumps component of the vaccine. 92 Thus, by 2006, Merck had the exclusive licenses to sell M-M-R II and ProQuad in the U.S., as well as licenses to sell M-M-RVaxpro and ProQuad in Europe. 93 In 2007, Merck changed its M-M-R II labeling to reflect a decrease in the potency of the mumps component of the vaccine. Potency measures how much of the attenuated virus is included in each dose of the vaccine. The labeling change –approved by the FDA –allowed Merck to represent a lower minimum potency, from 20,000 to 12,500 TCID5o (or tissue culture infective dose, which is the scientific measure of vaccine potency). This represented a 37.5 percent reduction in how much of the attenuated virus could go into each dose of the vaccine. 94 At no time during Merck’s efforts to secure approval to change its M-M-R II labeling did Merck disclose to the FDA what Merck knew about the diminished efficacy of the vaccine. Nor did Merck take any steps to address the efficacy information that was falsely represented in the labeling. That portion of the labeling remained unchanged. 95 Merck was thus representing throughout the approval process that it could actually reduce how much attenuated virus Merck put into each vaccine shot and still maintain its represented 95 percent efficacy. Merck did so even though it knew that at the higher potency the vaccine was nowhere near this efficacy. Clearly, if the FDA had known the truth about the vaccine’s efficacy it would not have approved the labeling change to reduce the minimum potency. 96 With Merck’s significantly degraded vaccine as the only protection against the mumps in this country, there has remained a significant risk of a resurgence of mumps outbreaks. That is exactly what Krah –who was well aware of the Mumps Vaccine’s failings –predicted would occur. In a conversation he had with Relator Krahling in the midst of the “enhanced” PRN testing, Krah acknowledged that the efficacy of Merck’s vaccine had declined over time, explaining that the constant passaging of virus to make more vaccine for distribution had degraded the product. Krah predicted that because of this, mumps outbreaks would continue. And that is exactly what has happened. 97 In 2006, more than 6,500 cases of mumps were reported in the Mid-West in a highly vaccinated population. This was the largest mumps outbreak in almost twenty years and a significant spike from the annual average of 265 cases that had been reported for the years leading up to the 2006 outbreak. Astoundingly, 84 percent of the young adults who contracted the disease had been vaccinated with two doses of the Mumps Vaccine. 99 Even though Krah, the Merck investigator who ran Protocol 007, expected outbreaks to increase because of the degraded product, scientists at the CDC and elsewhere continued researching to understand the origins of such a large outbreak within a highly vaccinated population. One of the leading studies was led by Dr. Gustavo Dayan, then a doctor at the CDC, and published in 2008 in the New England Journal ofMedicine. After considering possible causes for the outbreak, Dr. Dayan recommended that “[fluture studies will help evaluate national vaccine policy, including whether the administration of a second dose of M-M- R vaccine at a later age or the administration of a third dose would provide a higher or a more durable immunity.” Gustavo H. Dayan, “Recent Resurgence of the Mumps in the United States,” New England Journal of Medicine, 358; 15 (Apr. 10,2008) 1580. 100 Dr. Dayan’s study ultimately concluded that “[a] more effective Mumps Vaccine or changes in vaccine policy may be needed to avert outbreaks and achieve elimination of mumps.” Id. (emphasis added). Of course, if Dr. Dayan had the benefit of what Merck knew but willfully withheld from the government and the public, his findings would have been significantly less equivocal on what needed to be done to stop the reemergence of mumps outbreaks. 101 At the same time Dr. Dayan published his study questioning whether it may be time for a new vaccine, Merck publicly proclaimed that its Mumps Vaccine had not been changed since its introduction in 1967 and that Merck had no plans to change it. So, while Dr. Dayan questioned whether it “may” be time for a new vaccine, Merck attempted to reassure the public that there was no need for any such change. The vaccine worked just fine. 102 In another study on the 2006 outbreak, several scientists questioned Merck’s use of the Jeryl Lynn strain, instead of a wild-type virus, in Merck’s PRN testing. They noted that with this kind of testing, vaccine efficacy can be significantly overstated because “good results can be obtained that do not reflect the actual ability of the vaccine to provide protection from disease. A vaccine failure is investigated properly only if, in addition to avidity testing, the ability of antibodies to neutralize wild mumps virus has been checked.” Heikki Peltola, et al., “Mumps Outbreaks in Canada and the United States: Time for New Thinking on Mumps Vaccine,” Clinical Infectious Diseases, 2007:45 (15 Aug. 2007) 459, 463. 103 What is perhaps most notable about this study is that it scientifically questioned Merck’s stated efficacy based solely on Merck’s use of the vaccine strain instead of a wild-type virus to test efficacy. The critique did not (and could not) even account for Merck’s concealed efforts to further inflate its efficacy results with the improper use of animal antibodies and the falsification of test data. 104 Currently, Emory University is conducting a clinical trial of its university students in yet another attempt to explain the cause for the 2006 mumps outbreak among college-age students who had received both doses of the vaccine. However, Merck is listed as a collaborator on that study and is providing funding, thus continuing to exert its influence to perpetuate its fraudulent efficacy findings. 105 Merck’s ongoing misrepresentations and omissions with respect to the effectiveness of its vaccine continue to conceal the role its degraded product played in the 2006 outbreak. 106 In his 2008 study, Dr. Dayan also predicted another mumps outbreak would follow three years after the 2006 outbreak. This followed from the three-year cycles in which outbreaks occurred before children were widely vaccinated for mumps. “[Iln the pre-vaccine era, mumps activity followed 3 year cycles, so the current low activity rate [at the time of his 2008 study] may be transient while another critical mass of susceptible persons accrues.” Dayan, New England Journal of Medicine. 358;15 at 15 87-88. 107 In August 2009, another mumps outbreak began just as Dr. Dayan predicted. As with the 2006 outbreak, the 2009 outbreak occurred despite high vaccination coverage among the U.S. children’s population. In total, roughly 5,000 cases were confirmed by the CDC during the 2009 outbreak. This outbreak reaffirmed Krah’s prediction that mumps outbreaks would reemerge and increase over time. 109 Because of the 2006 and 2009 outbreaks, the CDC has also pushed back its target date for eradicating mumps from its original 20 10 goal to no earlier than 2020. But no amount of extra time or dosages will be enough to eliminate the disease when the vaccine does not work as represented in the labeling. It will merely allow Merck to continue to misrepresent the vaccine’s efficacy and thereby maintain its exclusive hold on the Relevant Market with an inadequate vaccine. 110 To date, the government has not acted on Dr. Dayan’s conclusion that it “may” be time for a new Mumps Vaccine. Instead, it continues to build its strategy around the existing vaccine. Nor is Dr. Dayan likely to pursue his own conclusion. He left the CDC to take a position in the Clinical Department of Sanofi Pasteur, the vaccine division of the Sanofi Aventis Group, Merck’s partner in manufacturing and selling M-M-RVaxpro and ProQuad in Europe. Dr. Gerberding has also left the CDC. In January 2010, she became the president of Merck’s Vaccine Division, a position she holds currently. 112 The CDC works closely with the IAC. Indeed, “[a]lmost all of IAC’s educational materials are reviewed for technical accuracy by immunization experts at the CDC.” The CDC also provides the IAC with financial support for the purpose of educating health care professionals about U.S. vaccine recommendations. Several CDC physicians currently serve on IAC’s Advisory Board. So does the current Director of the National Vaccine Program Office at the Department of Health and Human Services. 114 Merck has done nothing to correct this widely disseminated misinformation, approved and supported by the CDC, about the efficacy of Merck’s Mumps Vaccine. If anything, through its funding and support of the IAC, Merck has once again positioned itself to facilitate the spread of this false efficacy information. 115 Through its false representations of the Mumps Vaccine’s efficacy rate and its efforts to conceal the significantly lower efficacy rate that the Protocol 007 testing confirmed, Merck has unlawfully monopolized the Relevant Market and foreclosed potential competitors from entering the Market with a new Mumps Vaccine. No manufacturer is going to sink the time, energy and resources into developing the vaccine for sale in the U.S. with the artificially high bar Merck has unlawfully devised. 116 Entering the Relevant Market would be particularly risky in the case of the Mumps Vaccine given the four-decade lock Merck has had on the Market. 117 But for Merck’s anticompetitive conduct, including its fraud and other misconduct, one or more competing manufacturers would have entered this lucrative Market –with its guaranteed sales of almost 8 million doses a year –with a competing Mumps Vaccine. For example, GlaxoSmithKline, a manufacturer of numerous FDA approved vaccines, has an M- M-R vaccine, PriorixB, that is widely sold in Europe, Canada, Australia and other markets. PriorixB is not licensed or sold in the U.S., even though the company has a U.S. patent covering the vaccine and, according to an industry journal, had plans to enter the U.S. market with it. 118 By continuing to monopolize the Relevant Market, by, inter alia, misrepresenting an artificially high efficacy rate, and engaging in the above-described misconduct, Merck has foreclosed GlaxoSmithKline and any other manufacturer from entering the U.S. market. So long as Merck continues to monopolize the Relevant Market and engage in this misconduct, these manufacturers will continue to be excluded from the Relevant Market and Merck will unlawfully retain its unlawful monopoly with a vaccine that does not provide adequate immunization. 119 There are no legitimate pro-competitive efficiencies that justify Merck’s anticompetitive and/or otherwise unlawful conduct or outweigh its substantial anticompetitive effects. 120 Merck’s unlawful conduct has harmed competition by foreclosing other manufacturers from entering the Relevant Market. Without such competition, Merck has been able to unlawfully maintain and profit from its monopoly in this Market even though it is manufacturing and selling a sub-par vaccine. In the absence of this illegal market foreclosure, other manufacturers would have entered the Relevant Market with a higher quality and/or cheaper vaccine. This competition, or the threat of such potential competition, would have forced Merck to respond by either selling its existing vaccine at a lower price or developing a better vaccine. 121 By unlawfully excluding and impairing competition, Merck’s conduct has caused Plaintiff and other Class members to pay more for Mumps Vaccine than they otherwise would have paid absent Merck’s illegal, exclusionary conduct. 122 Given the absence of any competition in the Relevant Market, Merck has used its unlawful monopoly power to charge artificially inflated prices for its Mumps Vaccine. During the Class Period, Merck increased the prices it charged private health providers such as Plaintiff for M-M-R II vaccine by an astounding 85%. See Figure 1. 123 As a result of Merck’s unlawful, anticompetitive conduct, Plaintiff and members of the Class were compelled to pay, and did pay, artificially high and supra-competitive prices for Mumps Vaccine. 124 Plaintiff and members of the Class have, as a consequence, sustained losses and damage to their business and property in the form of the payment of overcharges for Mumps Vaccine. The full amount of such damages will be calculated after discovery and upon proof at trial.